The Inflatable Reentry Vehicle Experiment (IRVE-3) was launched by sounding rocket at 7:01 a.m. Monday, July 23, 2012, from NASA's Wallops Flight Facility on Wallops Island, Va. This story was updated at 11:04 a.m. EDT. NASA launched a novel new heat shield prototype on a successful test flight Monday (July 23), a mission that sent a high-tech space balloon streaking through Earth's atmosphere at hypersonic speeds of up to Mach 10. The test flight blasted off atop a suborbital rocket at 7:01 a.m. EDT (1101 GMT) from NASA's Wallops Flight Facility on Wallops Island, Va. It sent a small capsule, called the Inflatable Re-entry Vehicle Experiment 3 (IRVE-3) into suborbital space, which deployed the inflatable heat shield and then plunged back down through Earth's atmosphere to splash down in the Atlantic Ocean. The mission, according to NASA, was an unqualified success and will help shape new re-entry systems for future spacecraft. The IRVE-3 flight was designed to demonstrate how the technology could be used for heat shields during atmospheric entries on future space missions. 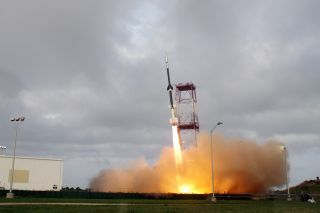 The successful test flight is, "a first step for how we explore other worlds," said Steve Jurczyk, deputy director of NASA's Langley Research Center in Hampton, Va.
"As far as the applicability of the technology, [we were] originally motivated to do this to allow us to potentially land more masses at Mars," said Neil Cheatwood, IRVE-3 principal investigator at Langley Research Center. "Mars is a very challenging destination. It has a very thin atmosphere — too much of an atmosphere to ignore, but not enough for us to do the things we would at other planets. That was our motivation about nine years ago when we started doing this stuff." With inflatable heat shields, scientists may be able to land at higher altitudes on Mars, or use the IRVE-3 technology to one day carry larger payloads, including humans, to the surface of the Red Planet, Cheatwood added. The IRVE-3 heat shield is a cone made up of inflatable rings that are wrapped in layers of high-tech thermal blankets to protect it (and its space capsule) from the searing heat of re-entry through Earth's atmosphere. The 680-pound (308-kg) heat shield prototype was packed inside a 22-inch wide (56-centimeter) nose cone for the test flight. It expanded to a heat shield 10 feet (3 meters) across during the flight. During the test, which was overseen by NASA's Langley Research Center, the IRVE-3 heat shield launched into space atop a Black Brant 4 rocket and separated from the booster six minutes later, about 280 miles (450 kilometers) above the Atlantic Ocean. IRVE-3 then inflated itself with nitrogen gas as expected, creating a mushroom-shaped heat shield known as an aeroshell. Four cameras aboard the IRVE-3 prototype recorded the capsule's plunge back to Earth, proving that its inflatable heat shield successfully withstood 20 Gs of force (20 times the force of gravity) and scorching temperatures of about 1,000 degrees Fahrenheit (537 degrees Celsius) during its re-entry at hypersonic speeds of up to 6,000 mph (9,656 kph). These NASA images depict the Inflatable Re-entry Vehicle Experiment (IRVE-3) packed into a nose cone, unfurls in space, then plummets at hypersonic speeds through Earth’s atmosphere to demonstrate the feasibility of inflatable spacecraft technology. Imaged posted July 17, 2012. The IRVE-3 heat shield splashed down in the Atlantic Ocean off the coast of North Carolina, where a high-speed U.S. Navy Stiletto boat crew is working to retrieve it. From launch to splashdown, the entire spaceflight took about 20 minutes, NASA officials said. The total cost of the test flight is roughly $17 million, Cheatwood told SPACE.com. "A team of NASA engineers and technicians spent the last three years preparing for the IRVE-3 flight," said Lesa Roe, director of NASA's Langley Research Center. "We are pushing the boundaries with this flight. We look forward to future test launches of even bigger inflatable aeroshells." But this isn't the first time NASA has launched an inflatable heat shield into space. The first IRVE experiment launched in 2007, but failed due to a booster failure. In 2009, the space agency successfully flew the IRVE-2 inflatable heat shield. The IRVE-3 payload, however, is heavier than the IRVE-2 design, and was subjected to more extreme re-entry heating than its predecessor. "We had our first successful launch of this technology almost 3 years ago here," Cheatwood said. "As a result, we've got a much bigger effort going on now. This was the next step in developing this technology."